Who isn’t watching their money these days? I’ve overheard people saying they’re buying gifts and that’s it, no holiday entertaining this year. But that’s not what being a Budget Smart Girl is about. It’s living the good life, yes, even throwing a party while not breaking the bank. Whether you’ve been asked to take an appetizer or side dish to someone else’s party or feel like throwing one of your own, you can serve guests foods that are pleasing to the eye and stomach and still stay within your budget. Not just a cheese and cracker platter, although it doesn’t take long to create one, but this is something that my mother used to put together for my birthday parties when I was a child. I’m not sure if she came up with the idea herself, but I’ll let her take the credit anyway. Mom would buy a couple of large baguettes to use as the centerpiece for the table. She’d then buy packages of cocktail sausages, put them on cocktail sticks and put them into the baguette. Another thing she used to do was put cheese and fruit together on the sticks. I like to put pineapple chunks with a reddish orange cheese and mandarin orange segments with varieties like Swiss cheese. (Cans of both pineapple chunks and mandarin oranges are on sale now) The best thing about using a loaf of bread as the centerpiece is nothing goes to waste. During the meal you can break it up and eat it with the cheese or even dip. And it doesn’t take much effort to slice it, toast it and serve it with things like meat and salsas. If you’re serving turkey and ham, take a note from most caterers and roll the meat up and then serve it on platters. One trick that does make deli cuts go further is to layer the meat with a mixture of cream cheese and herb like dill. Spread it on top of the meat, top this with another slice and continue until you’ve got a stack and then cut them into bite size wedges. And speaking of meats, how about serving mini-burgers. They seem to be very popular appetizers in restaurants these days. Mini hamburgers, turkey burgers and even things like black bean burgers. And I know cheese balls seem to be out of vogue right now, but they really are a great budget stretcher when you’re entertaining a crowd. How about disguising it? Roll the mixture into a log shape and cut it into medallion style pieces and place each one on a cracker or piece of toasted bread ready for your guests to sample. Whether it’s filo, puff or short crust, pastry is a bargain buy. Short crust pastry can be turned into mini quiches, puff pastry can be made into cheese straws, and filo can be used for sweet and savory fillings things like tuna salad, chopped chicken, cheese and spinach. Remember the edible gift article I wrote the other week? About how you can turn cream cheese into a gourmet treat? Here’s another idea I came with. 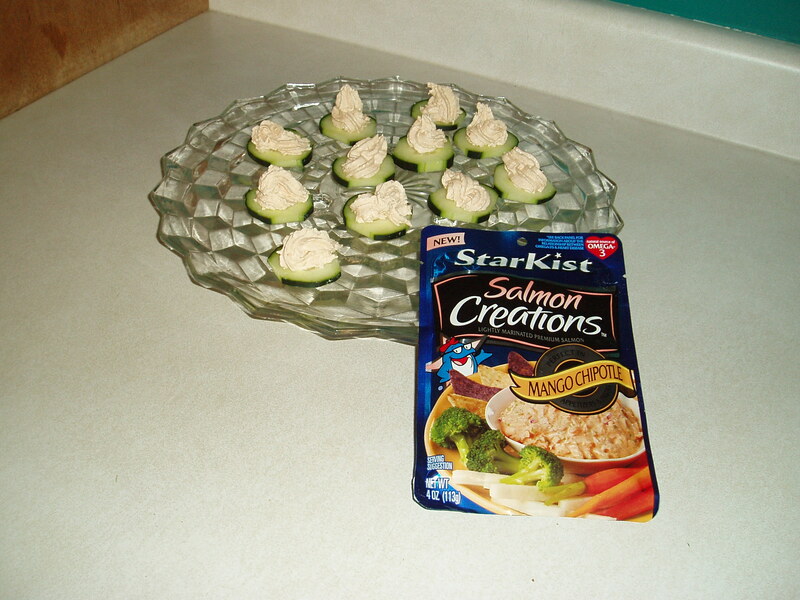 I bought a package of Starkist Salmon Creations. When I opened it, I thought it would make a great appetizer if it was combined with cream cheese. And I was right. Here you can see I piped it onto cucumber slices. Salmon and cucumber make a great combination. And if you use low fat cream cheese, it’s an appetizer, even those watching their weight can enjoy at your party. Total cost, well, here’s where using coupons on double coupon day pays off. The salmon was $1.85, I had a coupon for 50 cents so that was just 85 cents for the salmon. I had a $1 coupon for the cream cheese, no they didn’t owe me a dollar but the cream cheese ended up being free. The cucumber was 69 cents. So for $1.54 you have an appetizer. Desserts are probably the cheapest thing to serve guests, well, at least this time of the year. Who says they have to be cakes and dishes you’ve cooked all afternoon. The stores have sales on top of the line chocolates. So how about a chocolate and fruit platter. Cakes and cookies are also on sale. I’ve sometimes bought brownies and cheesecakes and used holiday themed cookie cutters on them. One year I had brownies in the shape of Christmas trees, topped with cherries and whipped cream. And for the cheesecake I’ve used round cookie cutters and drizzled melted dark chocolate each mini cheesecake.